Whew! We’ve had quite a busy week. How about you? We had family over (Brigette’s brother and sister-in-law, plus the most well-behaved dog on the planet, Count Chocula), and we had a fabulous dinner and a great Christmas. Then someone (not us) ordered up a white Christmas and it arrived the day after. If you’ve ever seen the movie A Christmas Story where the snow is coming down at the end and the mom turns out the living room light and they watch the perfect snowfall, that’s what it felt like. The snow was really pretty and, OK, we may have missed having snow in December. 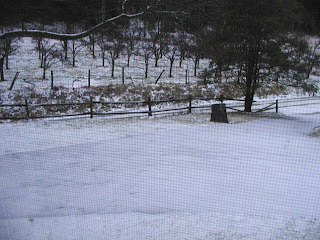 It was nice to have this snowfall, which melted later in the day. A good balance. Shortly after Christmas, our friends from Ohio came to visit and we got to catch up. 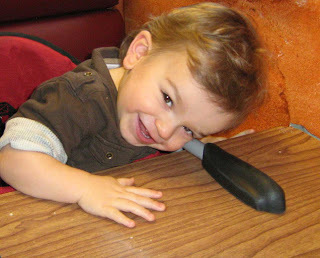 And hang out with the very talkative, very active, extremely cute 1-year-old, Roman. Csaba the innpug just adores his buddy Roman. The happiest we have ever seen Csaba was when he met Roman for the first time last year. Csaba has missed Roman a lot. He made up for missed time with hundreds of pug kisses, though. We’re now settling in for a relaxing New Year’s Eve, where we’ll be toasting the new year and thinking up some fun resolutions for 2008. This entry was posted in Uncategorized and tagged innkeepers and innpugs, Winter by Inn on Mill Creek. Bookmark the permalink.